Romania: homophobic referendum fails. Time to work towards equality. 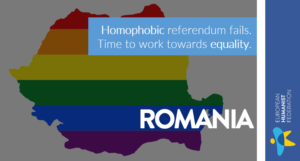 Bucharest, Romania – The EHF congratulates the Romanian people for refusing the exclusionary ideas pushed by extremist reactionary lobbies and the Orthodox Church in this weekend’s homophobic referendum. We however remain vigilant that the message addressed by the people will be upheld in practice. This result comes after a number of controversies concerning the way this referendum was called by a government that hoped to divert public opinion’s attention from the various corruption scandals surrounding the ruling party. , said Giulio Ercolessi, President of the European Humanist Federation. The bid to introduce a ban on gay marriage in the Constitution miserably failed today in Romania. Despite the support not just by right-wing or extremist parties, but also by the Socialist government and despite the efforts of the powerful Orthodox church, despite the unprecedented extension of opening time of polling stations in order to reach the (very low) 30 per cent of voters necessary to validate the results, the threshold was not reached and the referendum failed. Opponents to the LGBTI cause are waning as a mere consequence of generational turnover. LGBTI rights have yet to be recognised in many legal systems, discrimination is still in force in many countries, hate crimes may be on the rise also as a consequence of irresponsible political speech. However, progressives are winning this cultural battle and extremists are losing it. The EHF now calls on Romanian policy-makers to take note of the message sent by Romanian voters. Instead of attempts to limit the definition of marriage for political gains, it is time to work towards full equality when it comes to LGBTI rights.